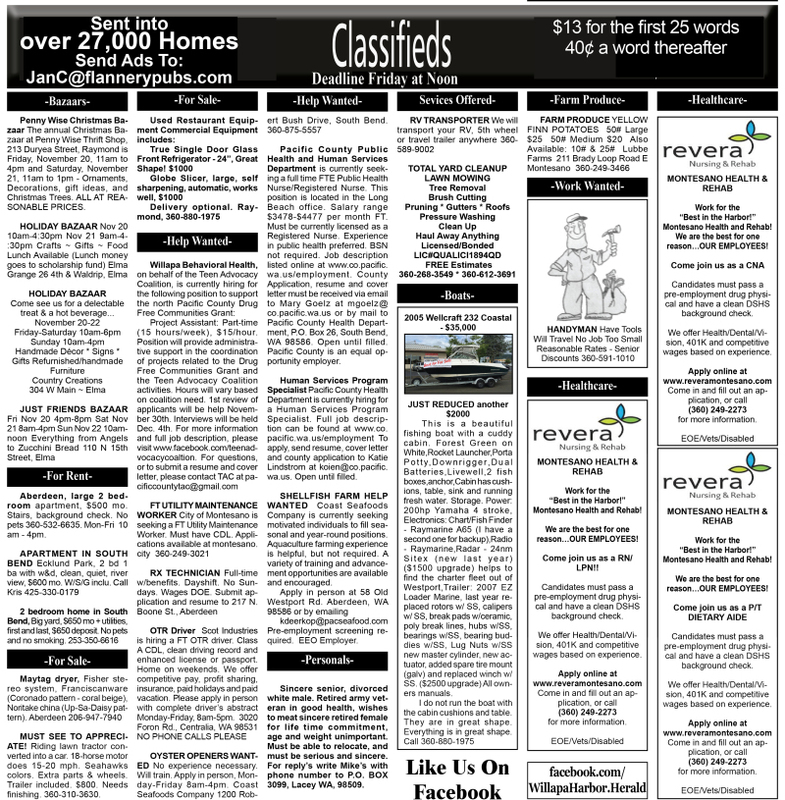 Showing 62 articles from November 17, 2015. 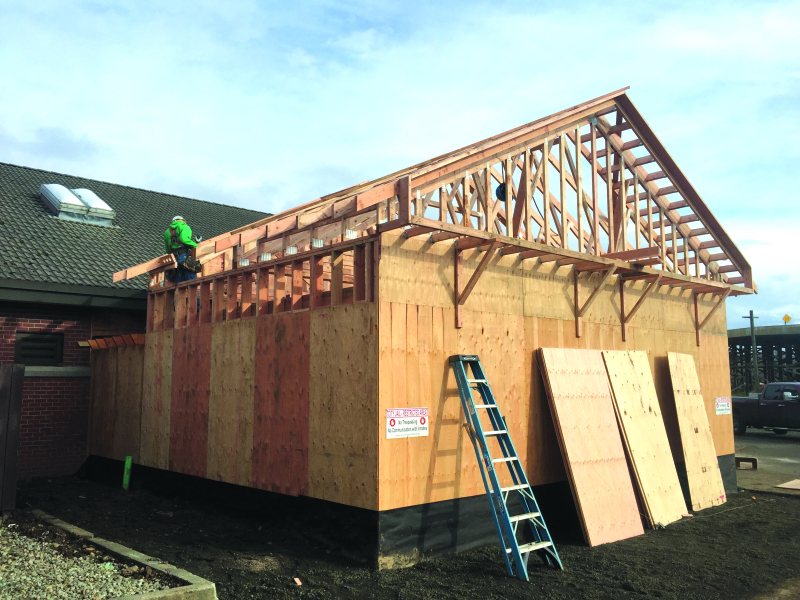 The Hoquiam City Jail is currently undergoing an expansion, that was the result of a bid request that was brought before the Hoquiam City Council. Map from the Pacific Northwest Regional Seismic Network showing the epicenter of the earthquake. The Pacific Northwest Regional Seismic Network reported a 2.4 magnitude earthquake at 3:36 a.m. on November 13. The epicenter of the earthquake was located 4.3 miles west of Hoquiam and 21.7 miles deep. 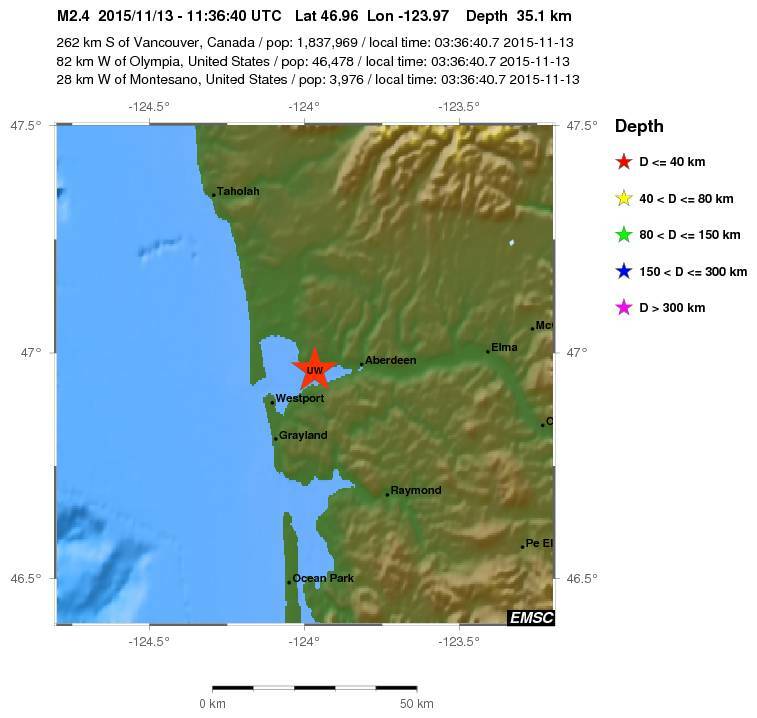 This would have located the earthquake west of Bowerman Field and the Grays Harbor Wildlife Refuge. Most of the voters said yes to the new stadium but under Washington law it has to be 60 %, only 51 % said yes. Additional efforts will be taken to make this a reality. The election is over and 17% of the voters have spoken. This failure to vote even though you are registered gives the people who do vote almost six votes in determining our future. High school students from Aberdeen and Hoquiam have been busy collecting donations for the annual Food Ball competition and have been seen at various locations in the community asking for Grays Harbor residents to help raise money and collect food for the holiday season. If you're hard pressed to find somebody a gift for the holidays, taking a stroll through the Country Closet might be the remedy. Small Business Saturday is beginning to be a tradition among local small businesses. The South Beach Arts Association in support of HAVA is asking community members to donate art for an art show scheduled for January 29 and 30. A van full of Grays Harbor residents was involved in an accident with a Thurston County Fire Engine over the weekend of November 7. A Montesano woman could face charges after an accident East of Ocean Shores Friday. The Washington State Patrol reports her 2002 Kia Sedona van was headed North on State Route 109 just before 9 Friday morning when an oncoming car crossed the centerline. The Friends of the Library is presenting their Christmas Book Sale. November 26, Thanksgiving Day, there will be a free Thanksgiving Dinner served at 1:00 pm at St. Francis Mission in Toledo. 139 Spencer Road. WSU Lewis County Extension is holding a free class titled Gifts From Your Kitchen. Long-time Winlock resident Jack Bay, 87, died peacefully Monday at the home of one his sons in Lacey, WA, where he had lived for the past 2-1/2 years. In memory and honor for the veterans, the Winlock School District hosted the annual Veterans Day Assembly. On November, 10 the Elementary School students and staff met in the gym for the assembly to begin. Castle Rock Chamber is sponsoring Shop Small on Nov 28, 10:00 am - 3:00 pm. This is the Small Business Saturday event that takes place across the nation on the Saturday after Black Friday. The 6.5 inches of rain over the weekend made things pretty soppy, but goes a long way towards offsetting last summer's drought. More rain is expected this week. Thanks to a predicted "strong El Nino" effect, the long-range forecast calls for a warmer and drier winter. Gathered in the Walton Science Center of Centrailia Community College people came from all around to witness a presentation given by famous Sasquatch researcher, Cliff Barackman. He is well known for his involvement on the show "Finding Bigfoot." 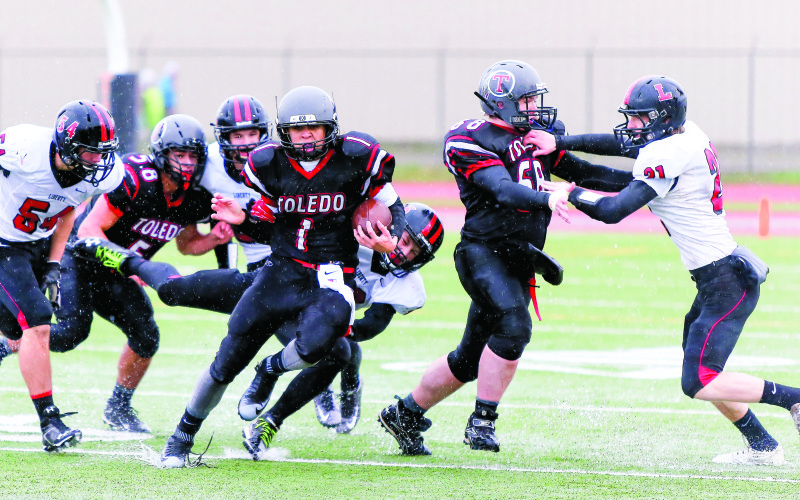 Facing each other for the first round of playoffs, the Toledo Indians and Rainer Mountaineers competed against each other for the advancement onto the 2B bracket State Playoffs. After warm ups, the Mountaineers and Indians greeted each other at the center of the 50 yard line. At this time, the coin was flipped for which team would be receiving the opening kickoff. The result of the coin toss was for the Toledo Indians to receive the kickoff. Toledo High School Art students will paint local shop windows with holiday themes again this year. Started five years ago by Art Teacher Ron Gaul, the decorations have become a signal to the community that the holidays have begun. During the first weekend of November, people from Toledo and surrounding areas gathered into the streets of Toledo for the Veterans Day Parade. Remembrances: Sherry Fox, a key figure with Toledo Food Bank many years, passed away October 30. She will be missed. Election is over-all signs are down -back to our daily routine. Now it is time to look forward and plan the holidays. With Thanksgiving around the corner, it's hard to imagine our country going through anything like Paris did this past week. 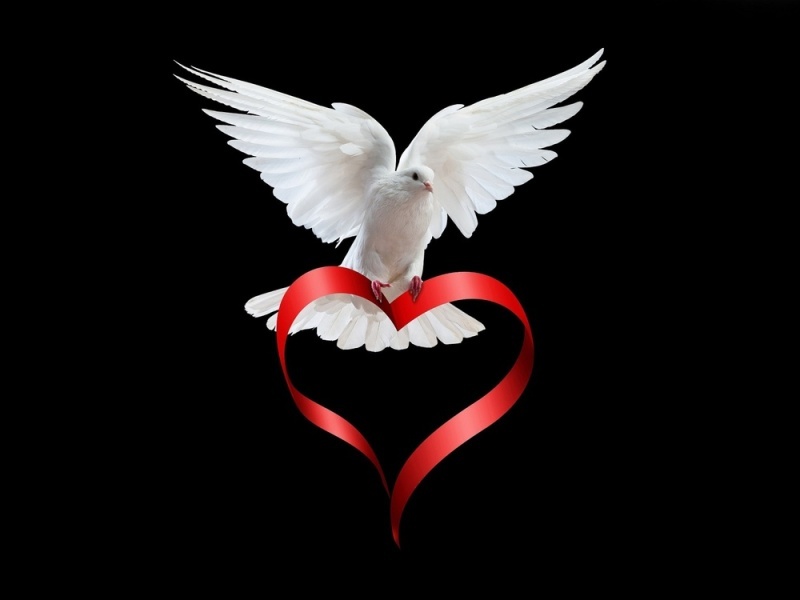 Our thoughts and prayers are with the people of France. Cascade Bancorp, the holding company for Bank of the Cascades, announced October 28 that it has entered into an agreement to purchase 12 Oregon and three Washington branch locations from Bank of America. Raymond, Westport and Cathlamet are the locations for the Washington branches. 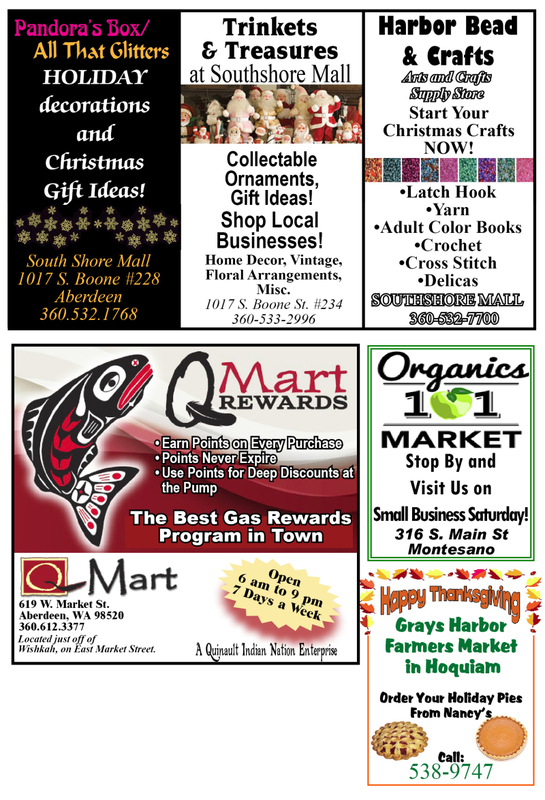 The first weekend of December will be a busy one for the community of Willapa Harbor as Santa helps to ring in the season with events in the cities of South Bend and Raymond. BAY CENTER - Marshall N. Disney, 26 of Bay Center, was booked into the Pacific County Jail for Residential Burglary, Resisting Arrest, Unlawful Possession of a Firearm, Escape, and for an outstanding Department of Corrections warrant. 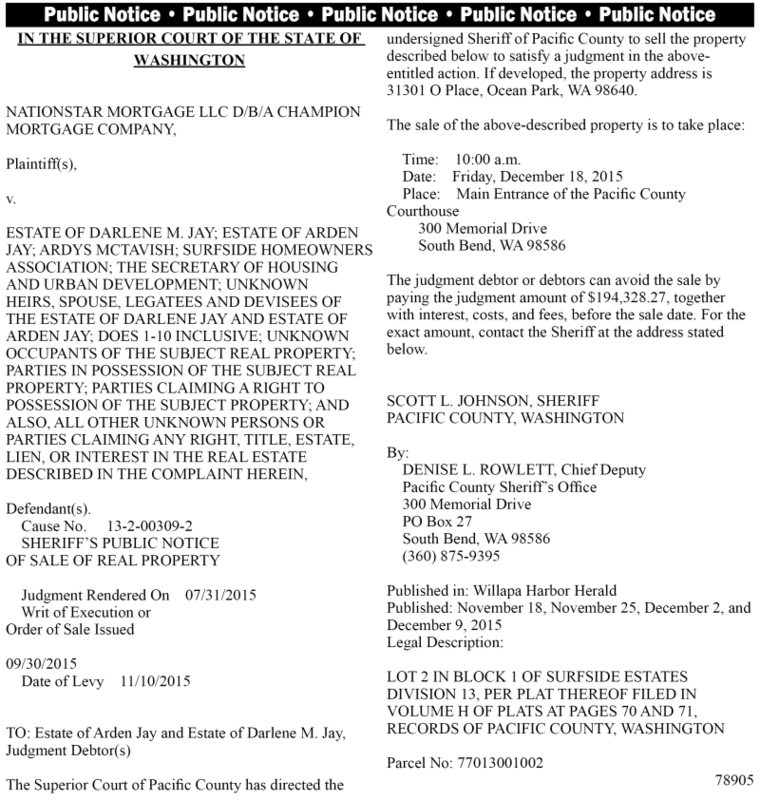 Disney's bail was set at $ 100,000. Don't miss your final chances to see "Belongings," by Daniel Fenton, produced by The Willapa Players at the Hannan Playhouse, 518 Eighth St. in Raymond. In one scene, Renny, played by Liz McCollum (right), uses a family portrait to distract Aunt Ella, played by LaRayne Watts, (center), from going into the house as her daughter Jimmie, played by Emma Shults (left), looks on. Final performance dates are Wednesday, Nov. 18 at 7:30 p.m., and Friday, Nov. 20 at 7:30 p.m. Tickets are $10 for general admission and $8 for seniors (over 65) and students (through college); and are available at South Bend Pharmacy, Everyone's Video and More, The Pitchwood Alehouse, and at the door. The U.S. Department of Agriculture Farm Service Agency has a portion of its farm loan program funds specifically set aside for minority and women producers announced Judy Olson, State Executive Director. "While FSA farm loans are available to all qualified applicants, by setting aside funds specifically for minorities and women, it ensures that they will receive a portion of available funds," said Olson. 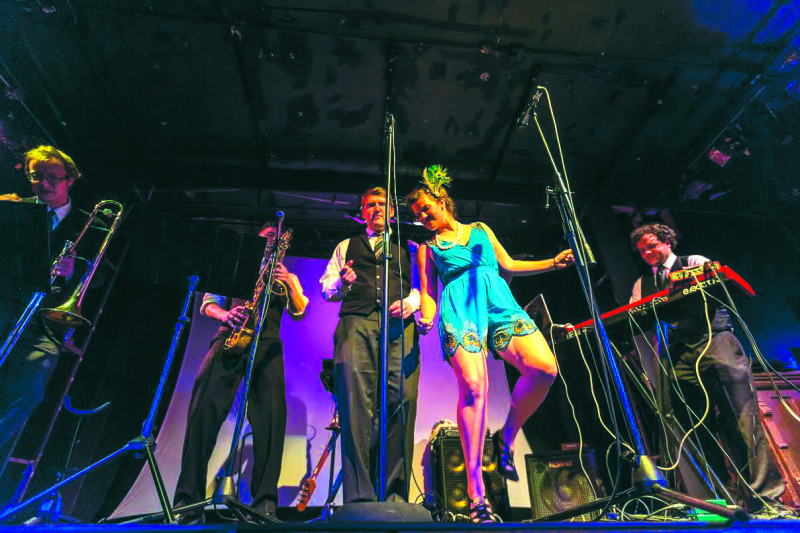 Imagine vintage swing meets electronic beat and you have an afternoon of Good Co at the historic Raymond Theater. The Willapa Harbor Herald proudly salutes the Pe Ell-Willapa Valley HS Football Cheerleaders as our Good Sports of the Week. Call your buddies and get ready for HAVA's first ever Basket Bingo on Saturday, Nov. 21, at the Raymond Elks Lodge. Bingo starts at 6 p.m. and HAVA has put together more than 20 gift baskets for the winners! 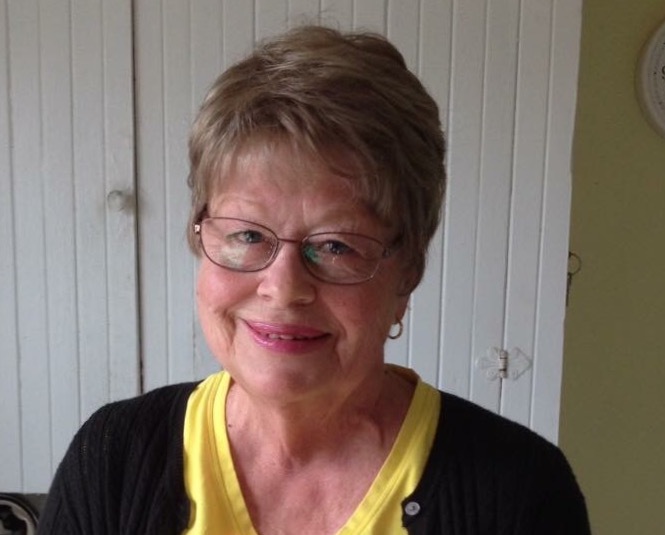 A memorial service for Jean Parsons will be held Saturday, November 21, 12:00 Noon at the Adventist Church on 1134 Crescent Street, Raymond. Rose Marie Muller passed away on November 9, 2015 at the age of 93. 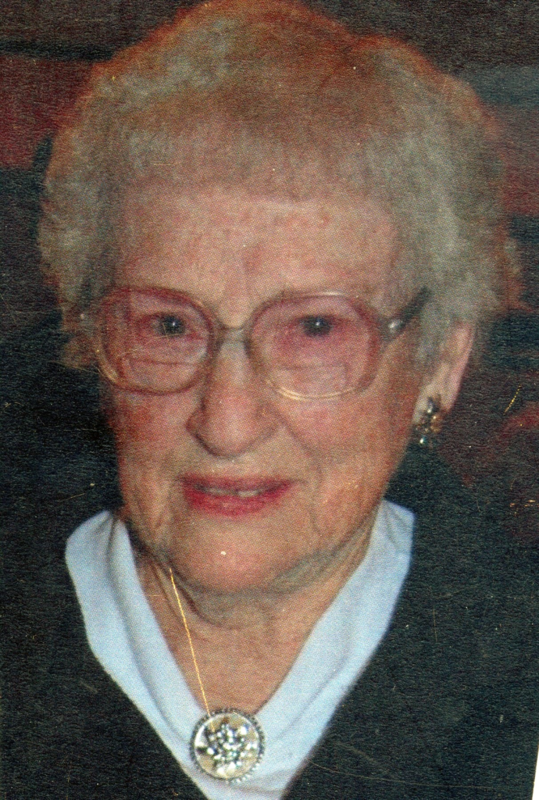 Sally Dorene Couch, 76, a lifelong resident of Chinook, passed peacefully on November 2, 2015 at her daughter's residence in Raymond, Washington. The Pacific County Commissioners met for the regular bi-monthly Board of Commissioners Meeting on Tuesday, November 10. The council called the meeting to order at 9am, with one member absent, Commissioner Steve Rogers. The board first heard from the public, where a member of the public name Gary Mauro reported on the progress of a certain investigation of a Mauch Sundown RV Park that had been in progress but is now complete. Raymond's volleyball came to an end in heartbreaking fashion (Nov. 4) when the Lady Seagulls fell in five games against Friday Harbor at Tenoski Gym in Menlo at the District IV Volleyball Tournament. Four of the sets in the elimination match were decided by two points. Friday Harbor prevailed 25-16, 31-33, 25-27, 26-24, 15-13. At the Washington State Cross Country Championships, local running standouts Traci Hoffman and Jachin Heckman showed why they are among the best in the state and the Ocosta Girls became the first girl's team in school history to take home a state title. Jim Dolin of Pacific County PUD, helped the eighth graders at Willapa Valley Middle and High School learn about the value of solar energy. 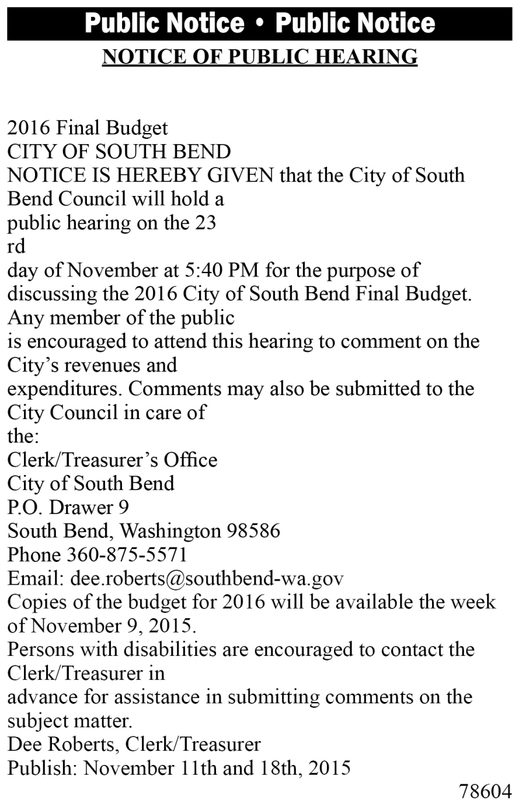 The South Bend City Council met Monday, November 9 for the regular city council meeting. Council Members Bob Hall and Bunny Williams were absent from the meeting. 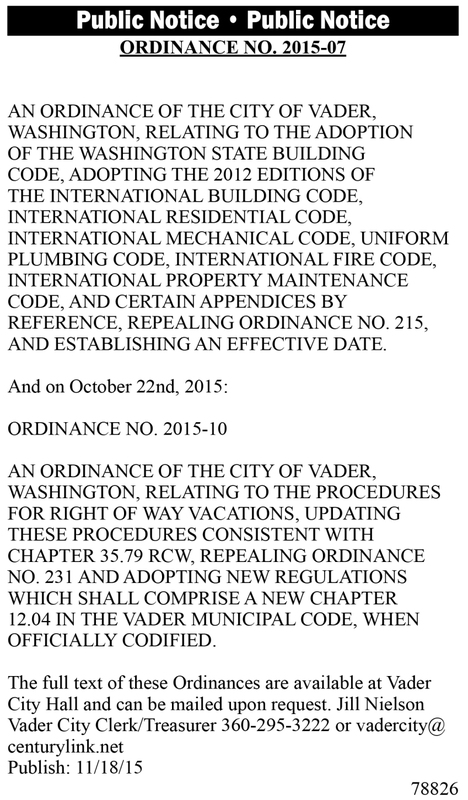 The council approved the minutes of the previous meeting as well as the meeting's agenda. "Let's move on to Ordinance #1506, the 2016 Property Tax Levy Second Reading," said Mayor Julie Struck. 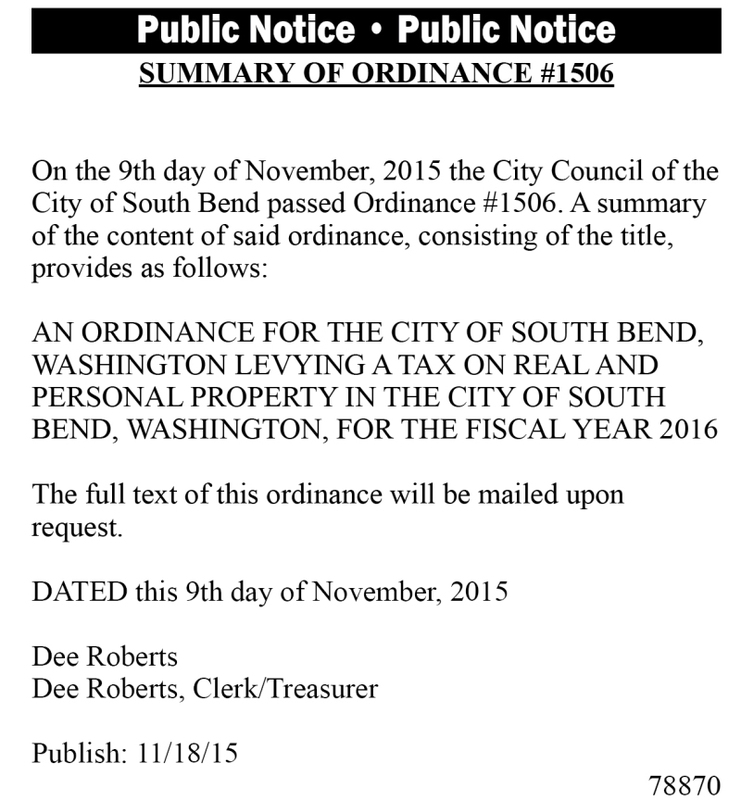 The council approved the 2016 Property Tax Levy a moved to the next item on the agenda. The council next approved the Cedar Street/Cowlitz Street Improvement project, finalizing it and marking it complete. 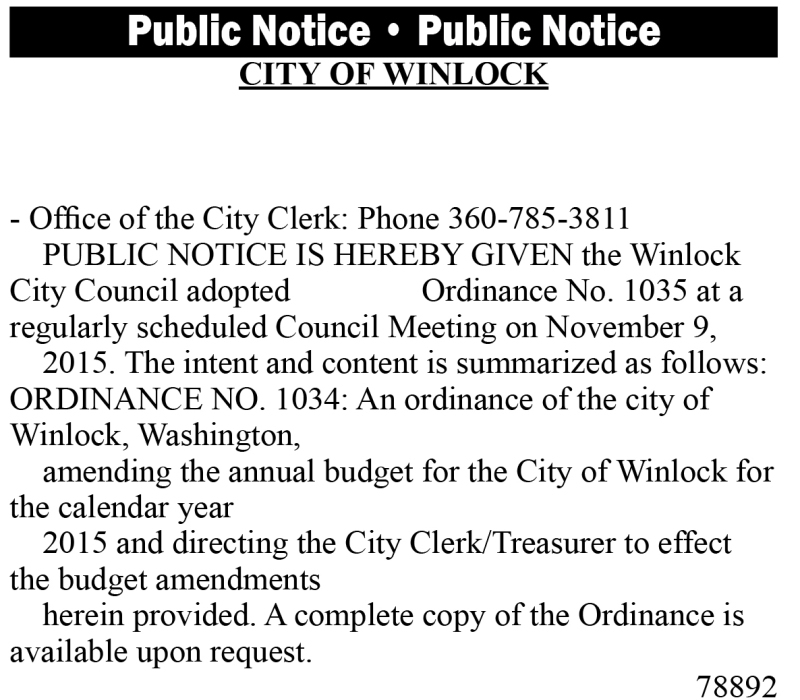 The Raymond City council met the night of Monday, November 16 with a full attendance. The first item that the Raymond City Council dealt with was the South Fork Island Plat, where Public Works Director Dean Parsons explained that the South Fork Island has been platted, and that a roadway is being constructed out to it. SOUTH BEND - Marcus Stigall, 27, of Olympia, formerly of Raymond, entered a guilty plea to intimidating a public servant for threats made to a Pacific County Deputy Sheriff's wife while in a local grocery store related to her husband's investigation of Stigall for multiple counts of violation of a domestic violence no contact order. Please spread the word...the Willapa Valley FBLA students are doing a lunch delivery on Friday, Nov. 20th to help support the Seattle Children's Hospital for their community service project this year. Put your orders in now and spread the word and help support these kids. If you would like to order a lunch delivered to you, please contact Ann Taylor at annt@willapavalley.org or an FBLA student to get an order form to fill out. The annual Thanksgiving Day meal, sponsored by the Willapa Harbor Ministerial Association is still in need of volunteers, folks to serve the meals and help waiting on tables, or help cleaning up following the meal. Over the past 4 months, the Washington State Patrol (WSP) has received numerous phone calls from the public indicating they have been contacted by our agency soliciting donations. Based on the information received from the public, the phone calls have been from individuals attempting to scam the public for money. A special license plate featuring a steelhead - the official state fish of Washington - could be an option for vehicle owners if a proposal for the new plate is approved by the state Legislature. 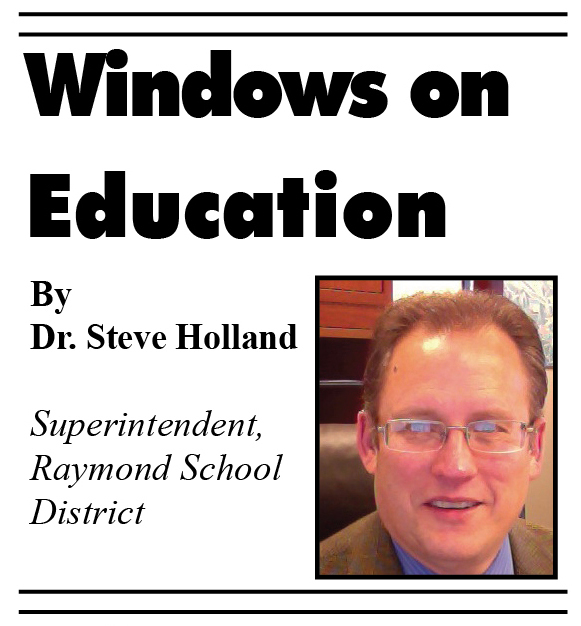 Windows on Education: What's on Your Mind? We have an amazingly complex brain, capable of everything from monitoring breathing to creating poetry. Here are nine scientific insights that we need to keep in mind as we try to help every child meet his or her potential. On Wednesday (Nov. 4) Willapa Valley was defeated by Onalaska in a loser-out game at Koplitz Field House in South Bend. The Vikings lost in five games to the Loggerettes 21-25, 25-17, 25-21, 21-25, 15-10.